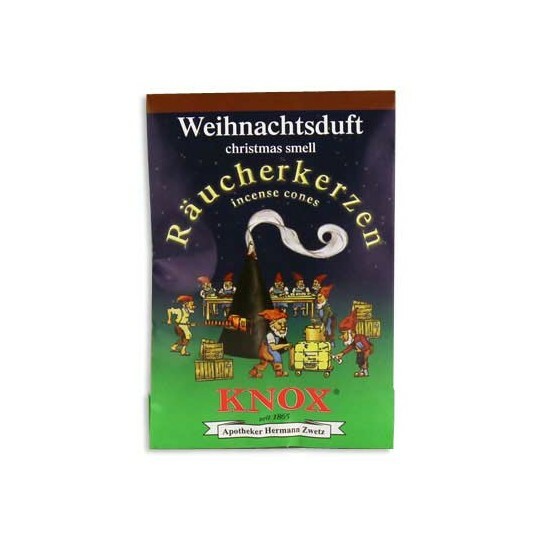 Purveyors of fine incense since 1865, Knox fragrance cones range from classic to Christmas scents and evoke a traditional ambiance during the holiday season. 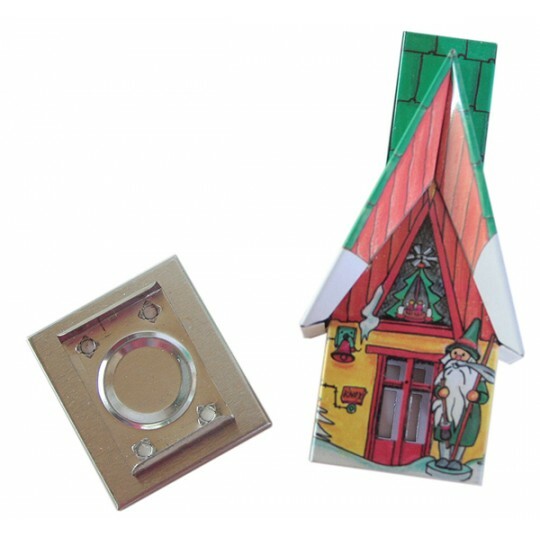 Pair your favorite scent with a metal smoker house or charming wooden smoker man made by Christian Ulbricht in Ezgebirge, Germany. 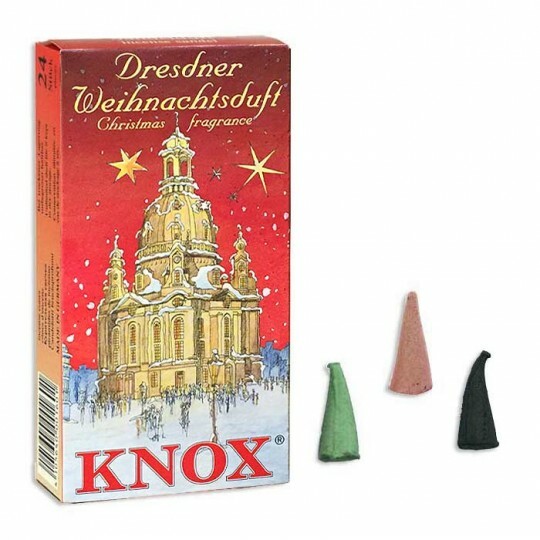 Scroll down to view our wide selection of incense cones and smokers, including an advent calendar that houses a different scent behind each window. 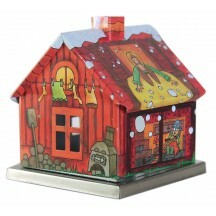 Decorated on all sides, this adorable metal incense smoker features scenes from the Hansel and Gretel fairytale. House lifts off its base to allow for placement of incense cone. 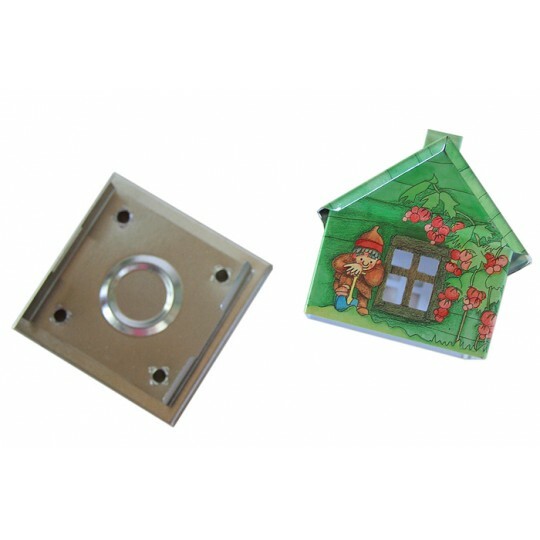 House measures 2-1/2" tall on a 2-1/4" by 2-1/4" base. 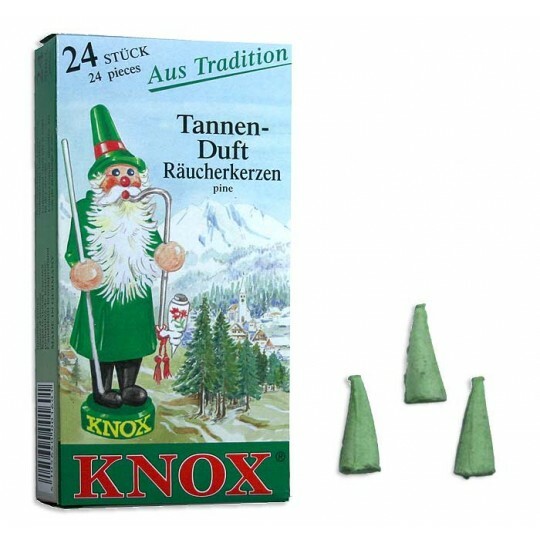 Included is a box of 24 medium inscense cones in pine scent. Cones are about 1-1/8" tall. 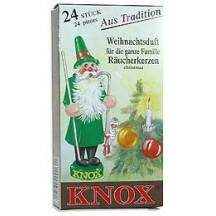 Made in Germany by Knox, the purveyor of fine traditional incense since 1865. 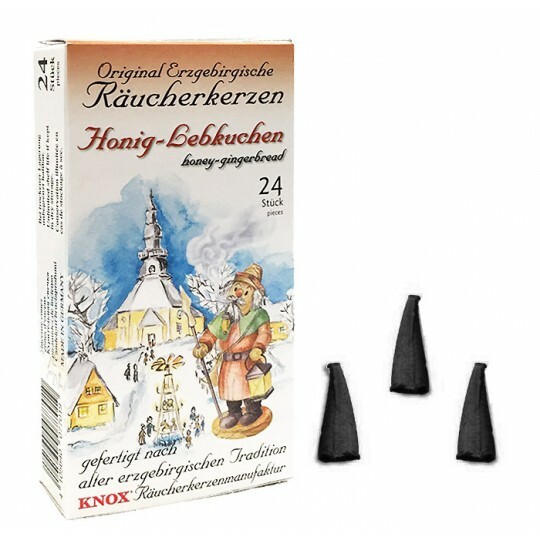 This charming box contains 24 miniature inscense cones in assorted Christmas scents -- pine, sandalwood, frankinscence, and myrrh. 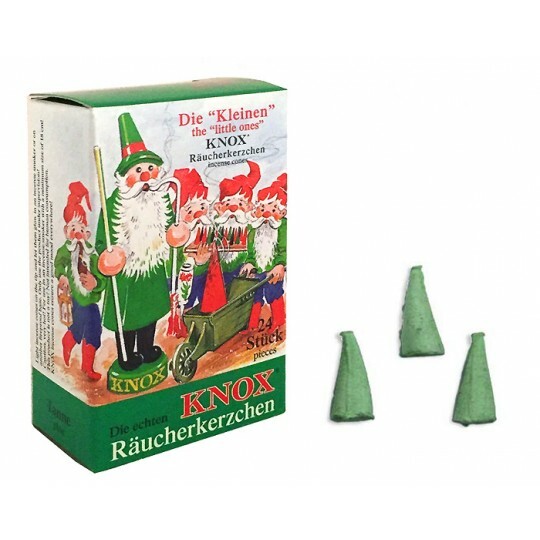 Cones are 5/8" tall; box measures 2 1/2" by 1 5/8". 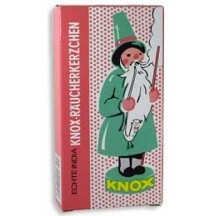 Made in Germany by Knox, the purveyor of fine traditional incense since 1865. 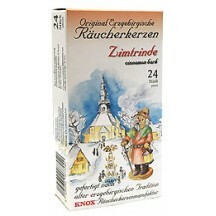 This charming box contains 24 miniature incense cones in Myrrh scent. 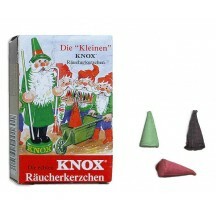 Cones are 5/8" tall; box measures 2 1/2" by 1 5/8". 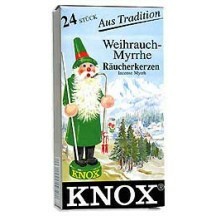 Made in Germany by Knox, the purveyor of fine traditional incense since 1865. This charming box contains 24 miniature inscense cones in Pine scent. 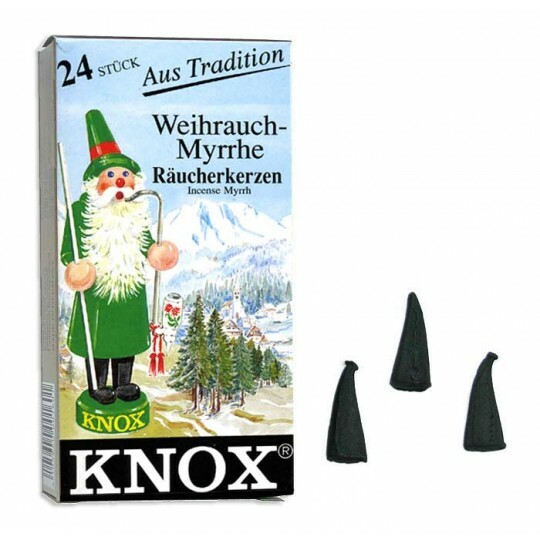 Cones are 5/8" tall; box measures 2 1/2" by 1 5/8". 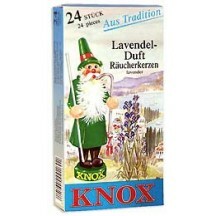 Made in Germany by Knox, the purveyor of fine traditional incense since 1865. 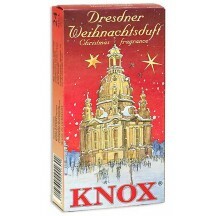 This charming Dresden Kirsche box contains 24 medium inscense cones in an assortment of Christmas scents -- pine, sandalwood, frankinscence, and myrrh. Cones are about 1 1/8" tall; box measures 4 7/8" by 2 1/2". 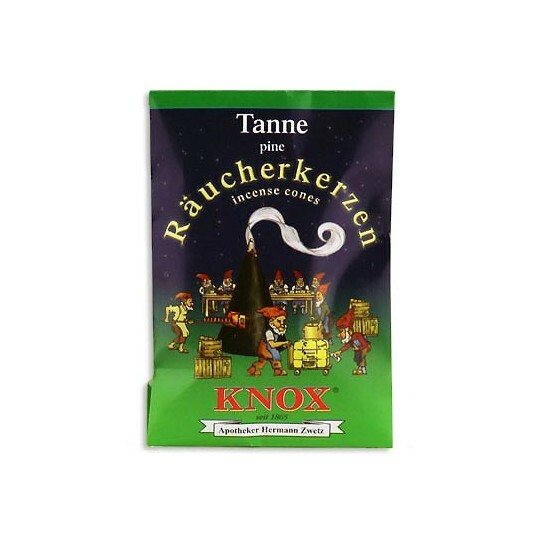 Made in Germany by Knox, the purveyor of fine traditional incense since 1865. 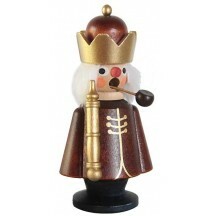 This charming Smoker Man box contains 24 medium incense cones in Christmas Apple scent. Cones are about 1 1/8" tall; box measures 4 7/8" by 2 1/2". 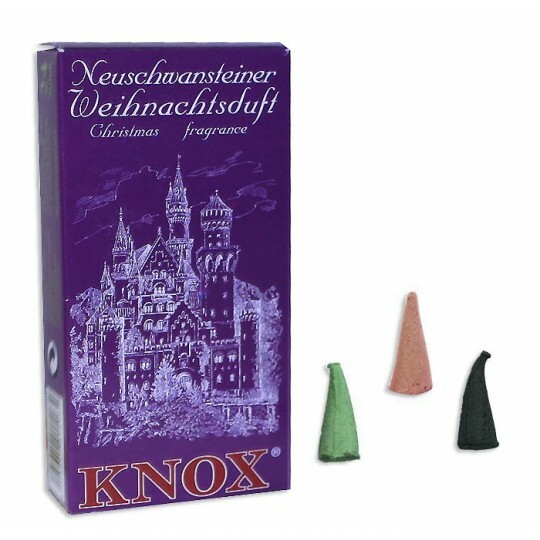 Made in Germany by Knox, the purveyor of fine traditional incense since 1865. This charming Smoker Man box contains 24 medium incense cones in cinnamon bark scent. Cones are about 1 1/8" tall; box measures 4 7/8" by 2 1/2". 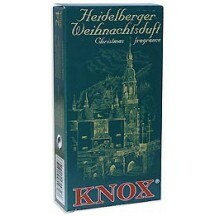 Made in Germany by Knox, the purveyor of fine traditional incense since 1865. This charming Smoker Man box contains 24 medium incense cones in forest scent. 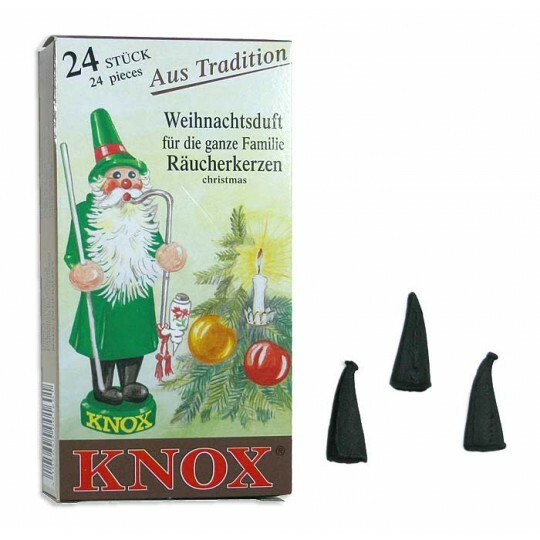 Cones are about 1 1/8" tall; box measures 4 7/8" by 2 1/2". 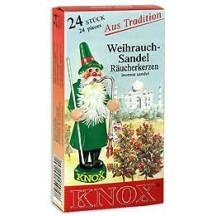 Made in Germany by Knox, the purveyor of fine traditional incense since 1865. 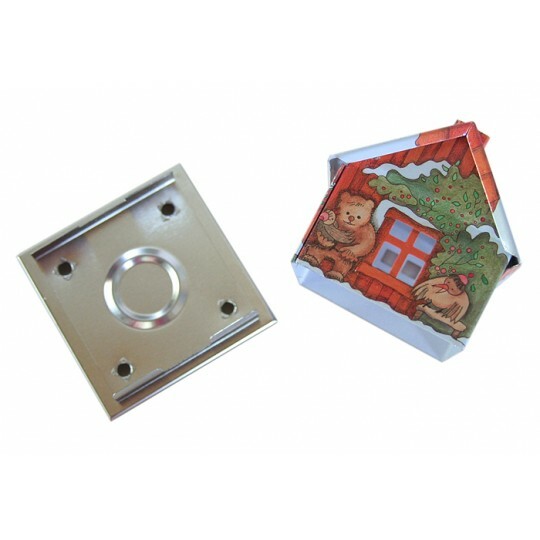 This charming Smoker Man box contains 24 medium incense cones in Honey Gingerbread scent. Cones are about 1 1/8" tall; box measures 4 7/8" by 2 1/2". 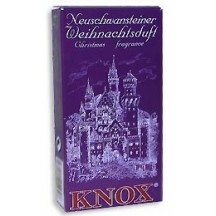 Made in Germany by Knox, the purveyor of fine traditional incense since 1865. This charming Nativity Scene box contains 24 medium incense cones in myrrh scent. 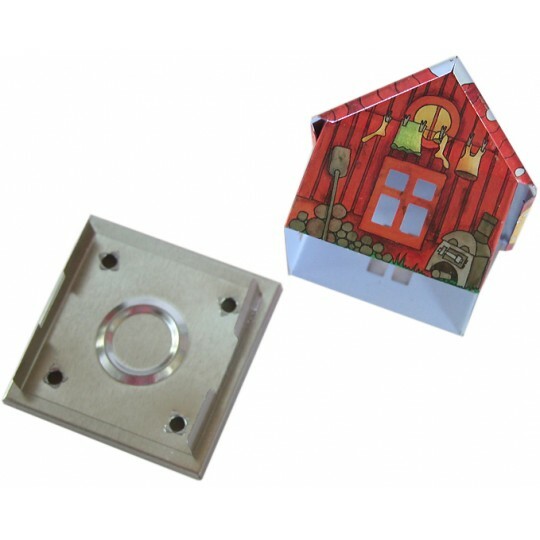 This box also includes a piece of chalk and a golden shell for burning the incense cones on. Cones are about 1 1/8" tall; box measures 4 7/8" by 2 1/2". 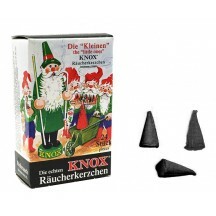 Made in Germany by Knox, the purveyor of fine traditional incense since 1865. 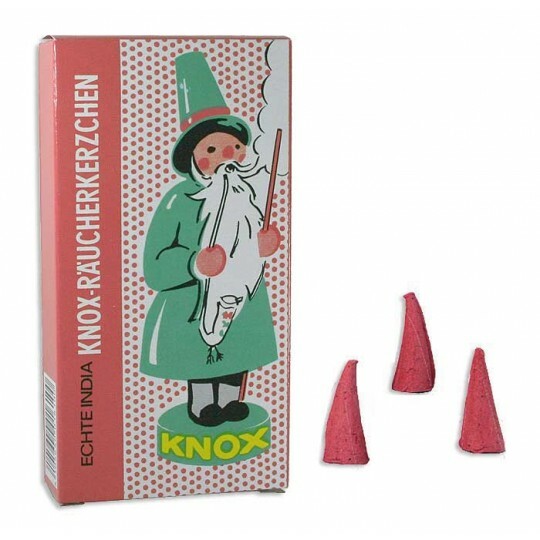 This charming box is a re-issue of vintage East German export packaging and contains 40 medium inscense cones in mixed scents. Cones are about 1 1/8" tall; box measures 4 1/2" by 6". 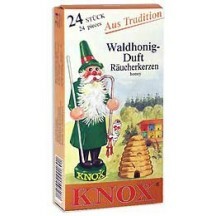 Made in Germany by Knox, the purveyor of fine traditional incense since 1865. This charming box contains 24 medium inscense cones in Christmas scent. Cones are about 1 1/8" tall; box measures 4 7/8" by 2 1/2". 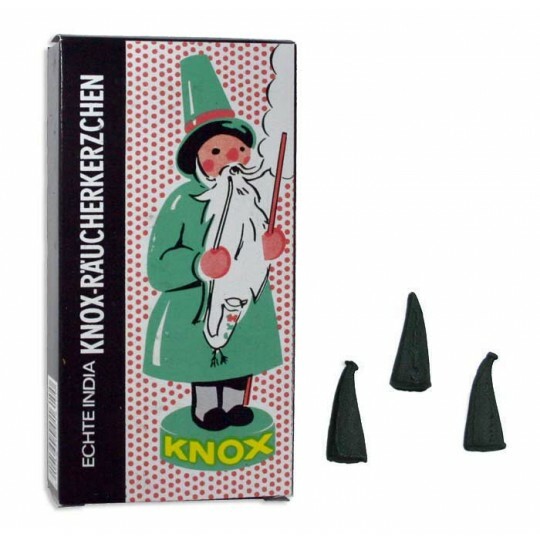 Made in Germany by Knox, the purveyor of fine traditional incense since 1865. This charming box contains 24 medium inscense cones in myrrh. Cones are about 1 1/8" tall; box measures 4 7/8" by 2 1/2". 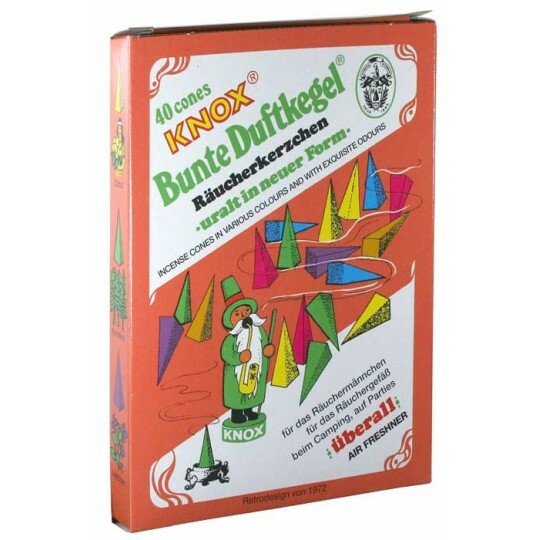 Made in Germany by Knox, the purveyor of fine traditional incense since 1865. 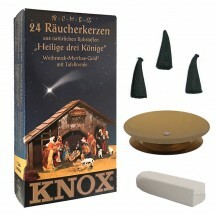 This charming box contains 24 medium inscense cones in a festive pine scent. Cones are about 1 1/8" tall; box measures 4 7/8" by 2 1/2". 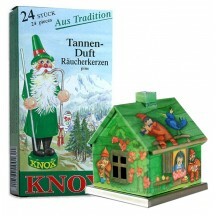 Made in Germany by Knox, the purveyor of fine traditional incense since 1865. 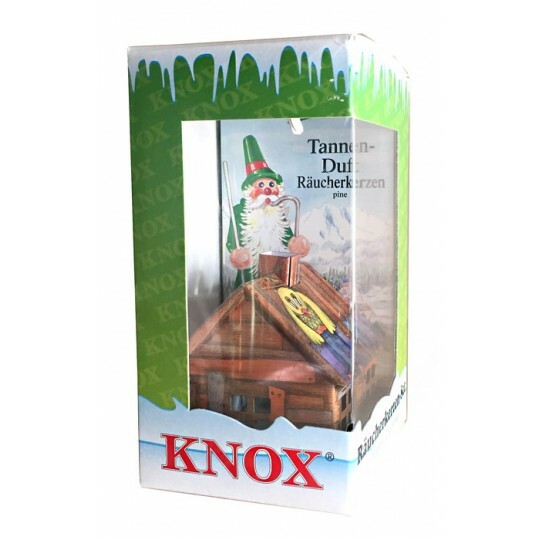 This charming box features an image of Castle Neuschwanstein and contains 24 medium inscense cones in an assortment of Christmas scents -- pine, sandalwood, frankinscence, and myrrh. Cones are about 1 1/8" tall; box measures 4 7/8" by 2 1/2". 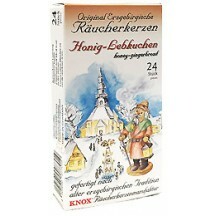 Made in Germany by Knox, the purveyor of fine traditional incense since 1865. This charming box features an image of Heidelberg Castle and contains 24 medium inscense cones in an assortment of Christmas scents -- pine, sandalwood, frankinscence, and myrrh. Cones are about 1 1/8" tall; box measures 4 7/8" by 2 1/2". 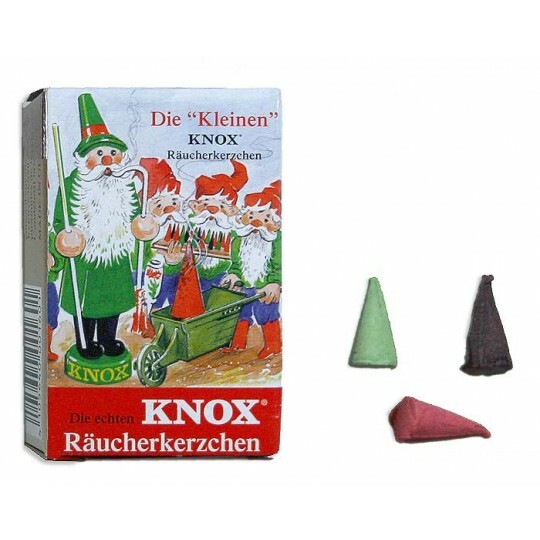 Made in Germany by Knox, the purveyor of fine traditional incense since 1865. This charming box contains 24 medium inscense cones in sandal. Cones are about 1 1/8" tall; box measures 4 7/8" by 2 1/2". 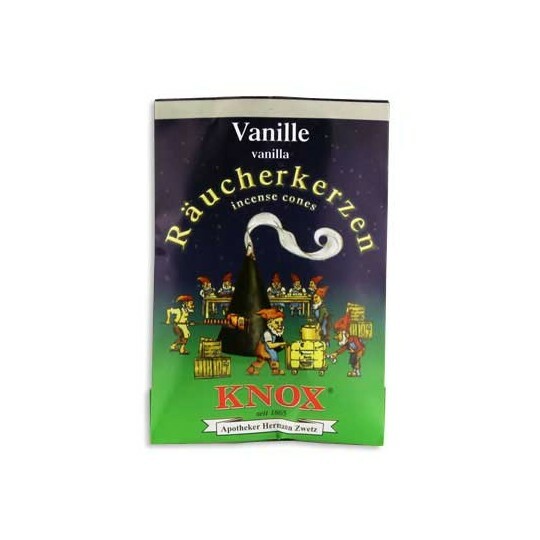 Made in Germany by Knox, the purveyor of fine traditional incense since 1865. This charming box contains 24 medium inscense cones in forest honey scent. Cones are about 1 1/8" tall; box measures 4 7/8" by 2 1/2". Made in Germany by Knox, the purveyor of fine traditional incense since 1865. This charming box contains 24 medium inscense cones in lavender scent. Cones are about 1 1/8" tall; box measures 4 7/8" by 2 1/2". Made in Germany by Knox, the purveyor of fine traditional incense since 1865. This charming box contains 24 medium inscense cones in violet scent. Cones are about 1 1/8" tall; box measures 4 7/8" by 2 1/2". 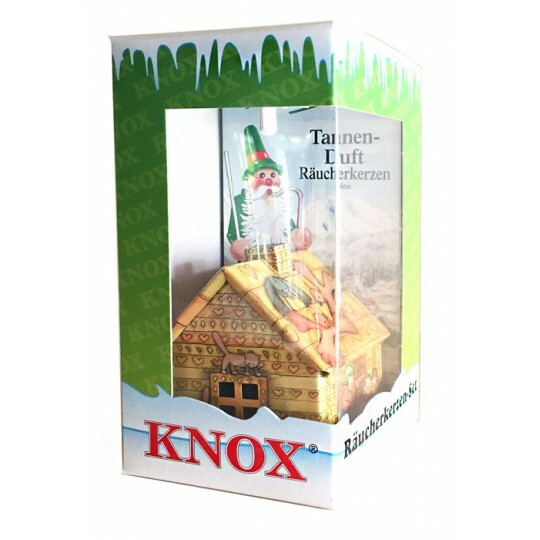 Made in Germany by Knox, the purveyor of fine traditional incense since 1865. This charming box is a re-issue of vintage East German export packaging and contains 24 medium inscense cones in myrrh scent. Cones are about 1 1/8" tall; box measures 4 7/8" by 2 1/2". 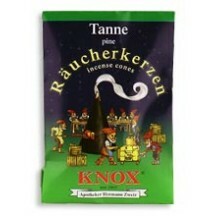 Made in Germany by Knox, the purveyor of fine traditional incense since 1865. 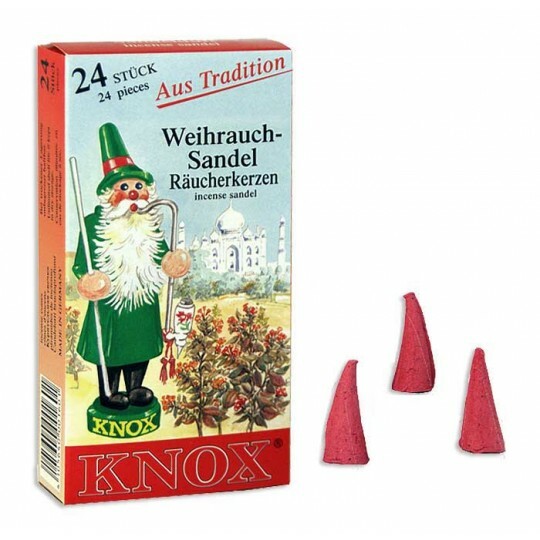 This charming box is a re-issue of vintage East German export packaging and contains 24 medium inscense cones in sandal scent. Cones are about 1 1/8" tall; box measures 4 7/8" by 2 1/2". 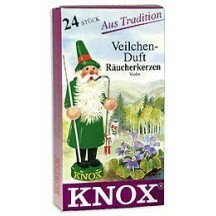 Made in Germany by Knox, the purveyor of fine traditional incense since 1865. 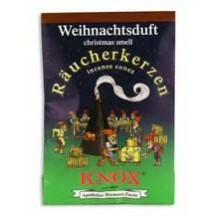 This charming pouch contains 5 medium inscense cones in Christmas scent. Cones are about 1 1/8" tall; paper envelope measures 3-5/8" by 2-1/2". 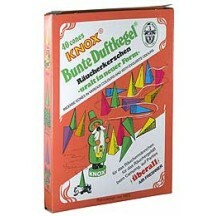 Made in Germany by Knox, the purveyor of fine traditional incense since 1865. This adorable pouch makes a perfect stocking stuffer. This charming pouch contains 5 medium inscense cones in pine scent. Cones are about 1 1/8" tall; paper envelope measures 3-5/8" by 2-1/2". 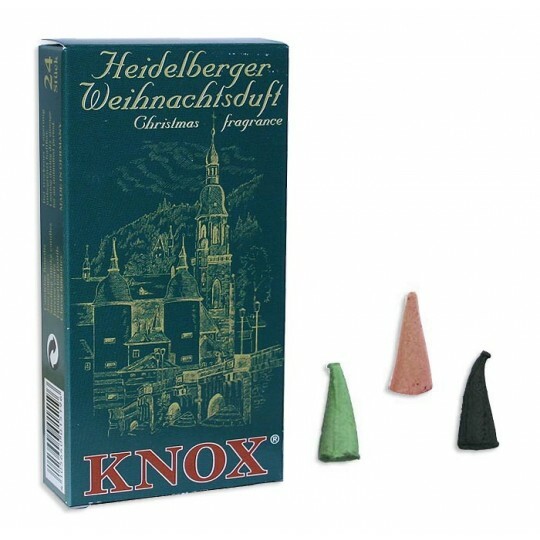 Made in Germany by Knox, the purveyor of fine traditional incense since 1865. This adorable pouch makes a perfect stocking stuffer. This charming pouch contains 5 medium inscense cones in vanilla scent. Cones are about 1 1/8" tall; paper envelope measures 3-5/8" by 2-1/2". 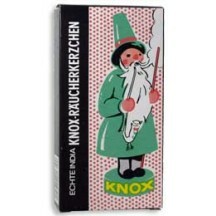 Made in Germany by Knox, the purveyor of fine traditional incense since 1865. This adorable pouch makes a perfect stocking stuffer. 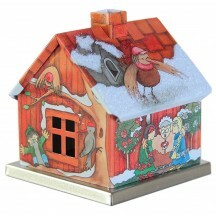 Decorated on all sides, this adorable metal incense smoker features scenes from Snow White - the dwarves doing chores and repairs on their cottage and Snow White resting. House lifts off its base to allow for placement of incense cone. House measures 2 1/2" tall on a 2 1/4" by 2 1/4" base. 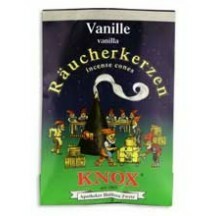 Imported from Knox in Germany. Sold separately, this smoker house requires medium incense cones. 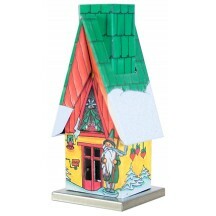 Decorated on all sides, this adorable metal incense smoker features scenes of Snow White and Rose Red. House lifts off its base to allow for placement of incense cone. House measures 2 1/2" tall on a 2 1/4" by 2 1/4" base. Imported from Knox in Germany. 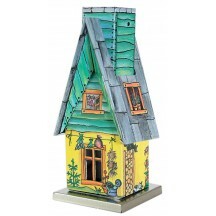 Sold separately, this smoker house requires medium incense cones. 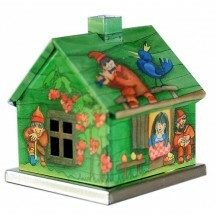 Decorated on all sides, this adorable metal incense smoker features scenes from the Hansel and Gretel fairytale. House lifts off its base to allow for placement of incense cone. House measures 2 1/2" tall on a 2 1/4" by 2 1/4" base. Imported from Knox in Germany. Sold separately, this smoker house requires medium incense cones. 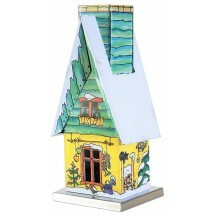 Decorated on all sides, this adorable metal incense smoker features scenes of a gardening shed in winter. House lifts off its base to allow for placement of incense cone. 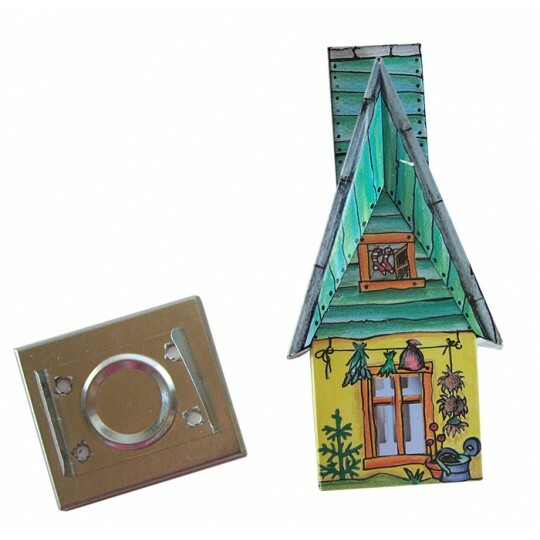 House measures 4-3/8" tall on a 1-3/4" by 2" base. Roof has snowy white glitter detailing. Imported from Knox in Germany. Sold separately, this smoker house requires medium incense cones. 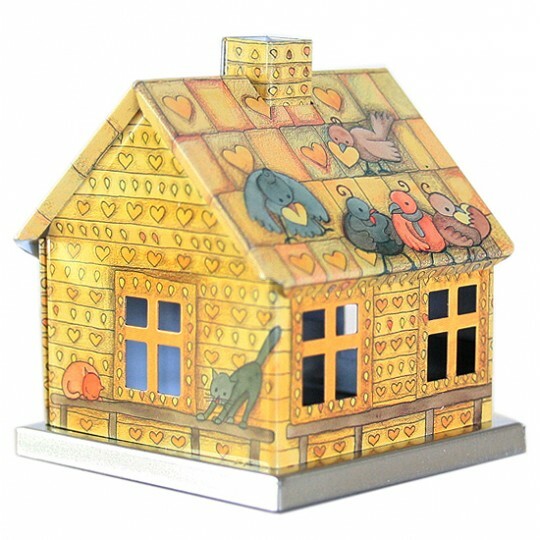 Decorated on all sides, this adorable metal incense smoker features scenes of a gardening shed in springtime. House lifts off its base to allow for placement of incense cone. House measures 4-3/8" tall on a 1-3/4" by 2" base. Imported from Knox in Germany. Sold separately, this smoker house requires medium incense cones. 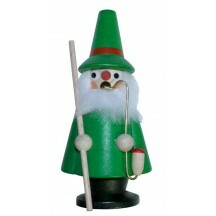 Decorated on all sides, this adorable metal incense smoker features a gnome with traditional Christmas decorations. House lifts off its base to allow for placement of incense cone. 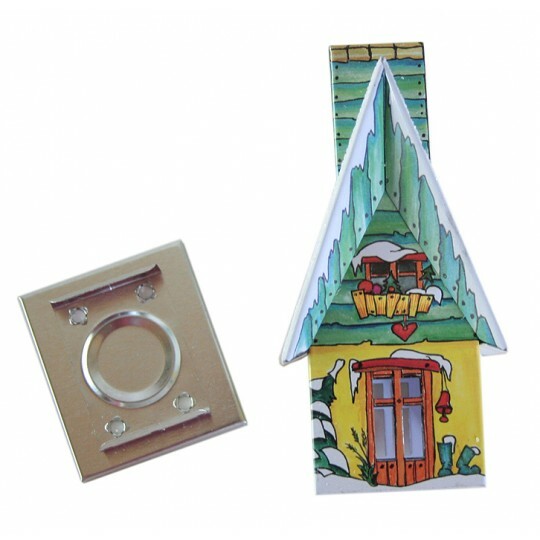 House measures 4-3/8" tall on a 1-3/4" by 2" base. Roof has snowy white glitter detailing. 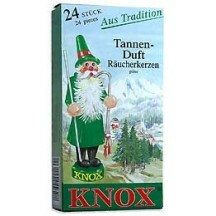 Imported from Knox in Germany. Sold separately, this smoker house requires medium incense cones. 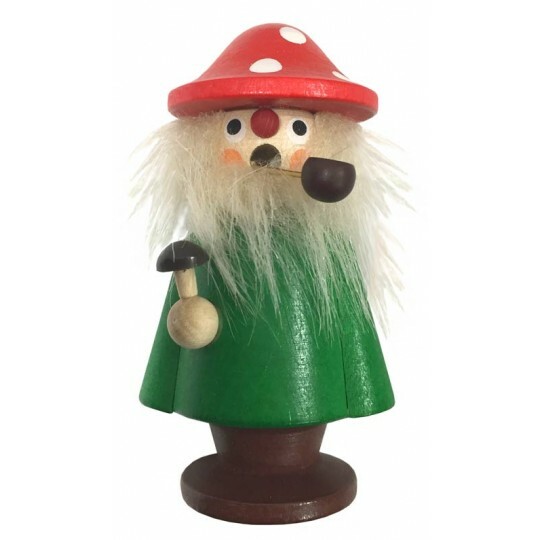 This petite wooden gnome incense smoker stands 4" tall and is handmade in the Erzgebirge region of Germany by renowned woodworker Christian Ulbricht. Charming hand painting and detailing make this smoker man an adorable addition to Christmas fesitvities to be enjoyed year after year. Sold separately, this smoker man requires mini incense cones. 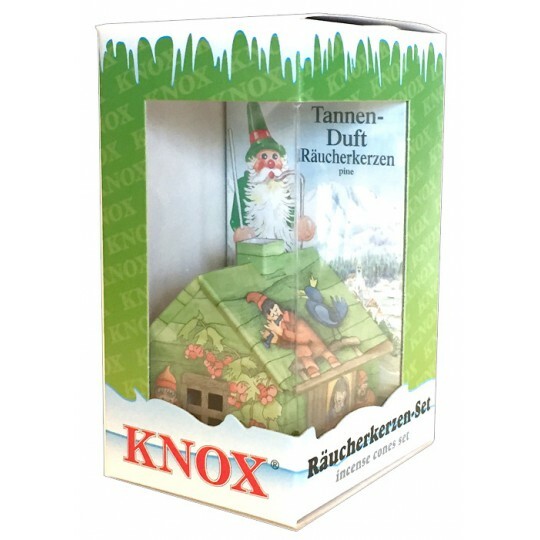 This petite wooden mail carrier incense smoker stands 4-1/2" tall to the top of his feather plume and is handmade in the Erzgebirge region of Germany by renowned woodworker Christian Ulbricht. 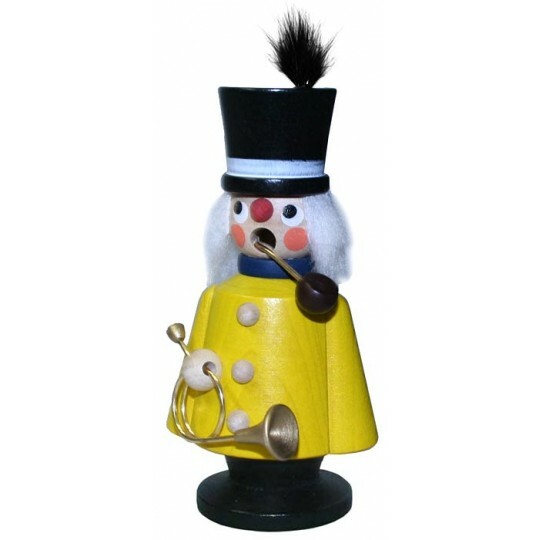 Charming hand painting and detailing make this smoker man an adorable addition to Christmas fesitvities to be enjoyed year after year. Sold separately, this smoker man requires mini incense cones. 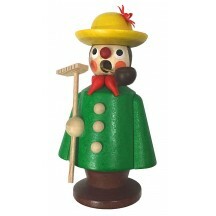 This petite wooden gardener incense smoker stands 3-1/2" tall to the top of his hat and is handmade in the Erzgebirge region of Germany by renowned woodworker Christian Ulbricht. Charming hand painting and detailing -- flower on hat and tiny rake -- make this smoker man an adorable addition to Christmas festivities to be enjoyed year after year. Sold separately, this smoker man requires mini incense cones. This petite wooden mushroom man incense smoker stands 3-1/2" tall to the top of his hat and is handmade in the Erzgebirge region of Germany by renowned woodworker Christian Ulbricht. 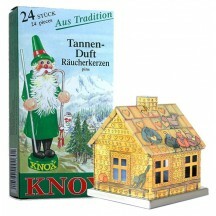 Charming hand painting and detailing make this smoker man an adorable addition to Christmas festivities to be enjoyed year after year. Sold separately, this smoker man requires mini incense cones. 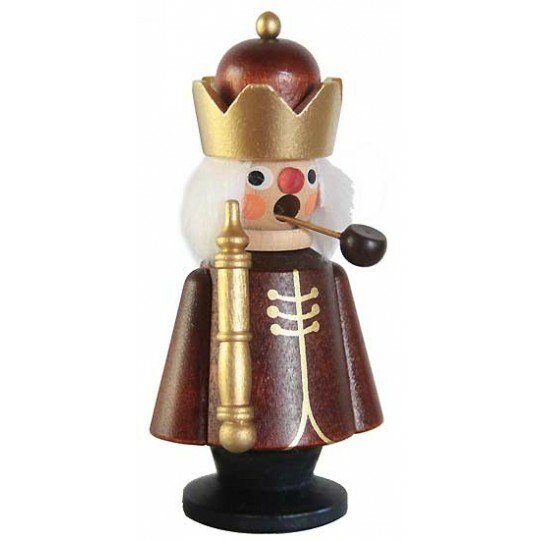 This petite wooden king incense smoker stands 4" tall to the top of his crown and is handmade in the Erzgebirge region of Germany by renowned woodworker Christian Ulbricht. 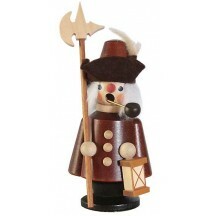 Charming natural wood and detailing make this smoker man an adorable addition to Christmas fesitvities to be enjoyed year after year. Sold separately, this smoker man requires mini incense cones. This petite wooden night watchman incense smoker stands 4-3/4" tall to the top of his axe and is handmade in the Erzgebirge region of Germany by renowned woodworker Christian Ulbricht. 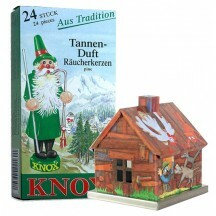 Charming natural wood and detailing make this smoker man an adorable addition to Christmas fesitvities to be enjoyed year after year. Sold separately, this smoker man requires mini incense cones.